Denver is one of the fastest growing cities in the country, and along with that population growth has come a dramatic explosion of our dining scene. Many great new restaurants open every month, and while some American cities have long histories of Italian, German, and other ethnic influences on their cuisine, Denver, as a younger, non-coastal city full of transplants, is more of a blank canvas–perfect for culinary innovation. Avanti Food and Beverage is an exciting new contemporary food hall in Denver featuring seven different restaurant concepts housed within one common space. Inspired by European food halls and the emerging popularity of American food trucks, Avanti opened in early 2015 and offers a space for new chefs and restaurateurs to try out innovative new restaurant concepts on short 1-2 year leases. By providing an appealing physical space and a strong customer base for these new concepts to be tested, chefs and restaurateurs can be more cutting edge; instead of allocating resources to all of the “non-food” aspects of starting a restaurant, they can focus on the food. 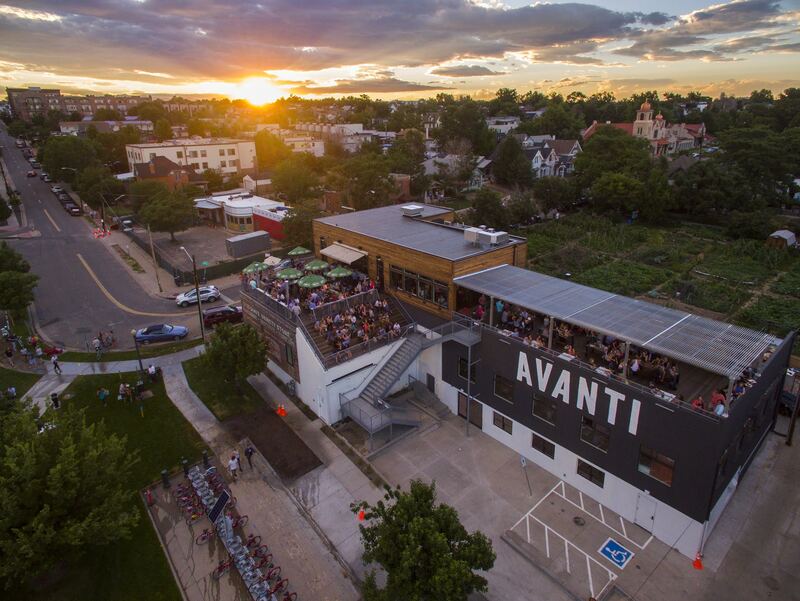 The decor at Avanti is contemporary and appealing, with each restaurant concept housed within a modified shipping container (shipping container architecture is a trend that is taking off in Denver and around the country). Patrons can come as a group and eat from different restaurants while sitting together–inside at a booth or table, outside on the rooftop at communal benches, or in the rooftop amphitheater-style seating with great views of the Denver skyline. Someone is craving pizza? They can get it from Brava Pizzeria della Strada. Someone needs gluten-free? They can choose Quiero Arepas. Someone wants local and sustainable? They can try out Farmer Girl. Food halls are an emerging trend across America, and Denver is a perfect city to capitalize on that trend. The Colorado Governor John Hickenlooper (who is the former Denver Mayor and a former brewpub owner) has used as a defining principle throughout his career and life in public office the idea that “there is no margin in making enemies.” Avanti is a microcosm for what I call collaborative competition, and this collaborative competition can be seen in other aspects of the Colorado economy. Colorado has the third most microbreweries per capita of any state in the country. These microbreweries, while in competition with each other, are also creating a whole that is greater than the sum of its parts. Every year, microbreweries assemble here in Denver for the Great American Beer Festival, the largest of its kind in the country. Throughout the year, the microbreweries collaborate with local food trucks, which take turns rotating through the microbreweries to provide patrons with food they wouldn’t otherwise be able to get on site. The microbreweries, in turn, provide the food trucks with a steady supply of (hungry) patrons. The food trucks also collaborate with each other by rallying together in the summer for Civic Center Eats, a biweekly assembly of food trucks in the heart of downtown. Concepts like Avanti that encourage culinary innovation and embrace collaborative competition are destined for success in cities like Denver, and I predict more food halls like it will pop up in the coming years both in Denver and in other American cities with significant population growth and cutting edge dining scenes.